Friends, the CCIW Region has had five years of great and positive relationship with our Guatemalan Mission partners Nora Colomo and Vittalino Similox from Concejo Ecumenico Cristiano de Guatemala ( The Ecumenical Council of Guatemala) We have taken a total of three pilgrimages, and the both the journey and education have been enriching and life altering. April10-15, 2016 we will make our fourth journey. There is an invitation for five persons ready to have a cross cultural experience to join this delegation. To take a look at human trafficking in the United States and Guatemala. Conduct a research about the theme, seen from a United States perspective. What is at stake? Which are the root causes, the consequences in terms of human rights, dignity and ethics, among others. Guatemalan women can then have their own research process about human trafficking from their point of view. They can also share with their churches about their findings. Sharing commons goals and dreams from each others’ reflections and research. To see the similarities and the differences in the approach to the theme. 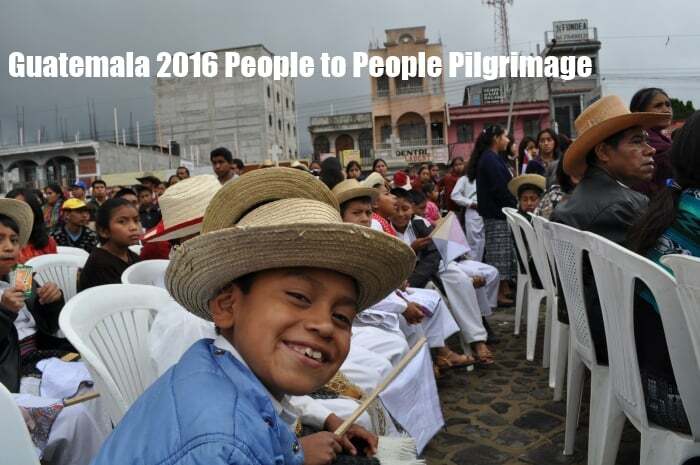 To work together towards a solidarity initiative where you can work together with pastoral accompaniment, advocacy and presence on both places (US and Guatemala). The Firm Deadline: January 30, 2016 (Application and Deposit must be into the Regional office on this date) No exceptions. To further develop a mutual relationship with the Council and explore opportunities for shared ministries. To learn and to share challenges and vision in ministry – visit council partner sites. A daily itinerary with emergency contact information will be available as we are closer to our travel dates. Make sure you have a valid Passport with at least six months (from April 10) remaining before expiration. Be sure emergency information is filled in on Passport. Make a copies of your passport identity page – one to take with you and one to leave at home. Attached medical form is to be returned to the CCIW Office if not already submitted. Travel in-country will likely be in small van with driver provided by partners. One checked bag (50 lbs. ), one carry-on bag (40 lbs), purse or small backpack. Bags can be lost. Pack essential items in carry-on bag. Global Ministries is aware of our travel plans and will make appropriate contacts for us. It is possible participants may be asked to introduce, speak, or read. At the close of the trip we gave our unspent Guatemalan currency as a gift to our wonderful driver and translator. Please check with your cell phone provider for service and costs in Guatemala. We will likely stay in a retreat center or hotel. They are aware of adjustments we may need to make for rest and diet. We will have bottled water for daily use. Not wise to drink or brush with tap water. While we want to be gracious guests, use your best judgment of what you eat. We will likely eat at a retreat center/hotel and occasionally as guests in churches, etc. About $100 cash would be enough for extras along the way. Our partners will help with some exchange of currency when we arrive. Check with your credit-card provider regarding use of card in Guatemala.